It was not until my mid-twenties I ventured into the land of baking beyond my favorite tried and true cookie and cake recipes. Back then I could have baked chocolate chip cookies with my eyes closed and have them come out of the oven perfect. With cakes I had bit of a learning curve to master the intricacies of scratch cake baking. I learned a kitchen scale is truly your best friend and by not using one I risked having to throw my cakes in the garbage because no one would eat them. However, baking beyond my comfort level was never an issue for me because I chose not to even try. One of the most intimidating ingredients others baked with but I avoided was puff pastry sheets. The only reason I was so fearful of puff pastry is because something as delicate and enjoyable as stacked layers of pastry dough had to be difficult to handle, or so I thought. However, little did I know how easy it actually was. Not only was it easier than rolling out pie crust, it was easier than baking cakes. 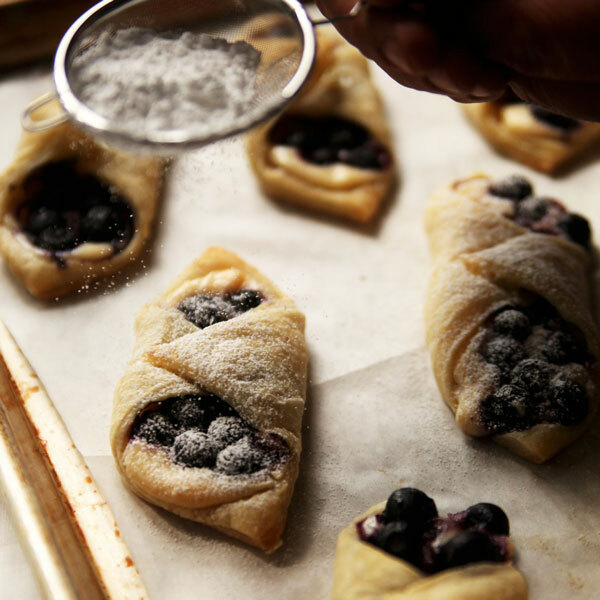 Once I started baking with puff pastry I realized how easy it could be to use in both savory and sweet dishes. The real revelation about the awesomeness of puff pastry sheets came to me after eating fruit tarts from a grocery store bakery which tasted exactly like the ones I made at home. It was in these moments I re-acquainted myself with baking with puff pastry without hesitation or fear. Today I’m sharing with you one of my most favorite pastries to make at home. These Blueberry Lemon Cheesecake Tarts are so easy to make. Not only are they easy to prepare, they taste like something you would order from your favorite café or bakery. To make them, all you do is cut the puff pastry into smaller squares and add a delicious creamy lemon cheesecake filling. The filling requires three ingredients – cream cheese, condensed milk, and lemon curd. 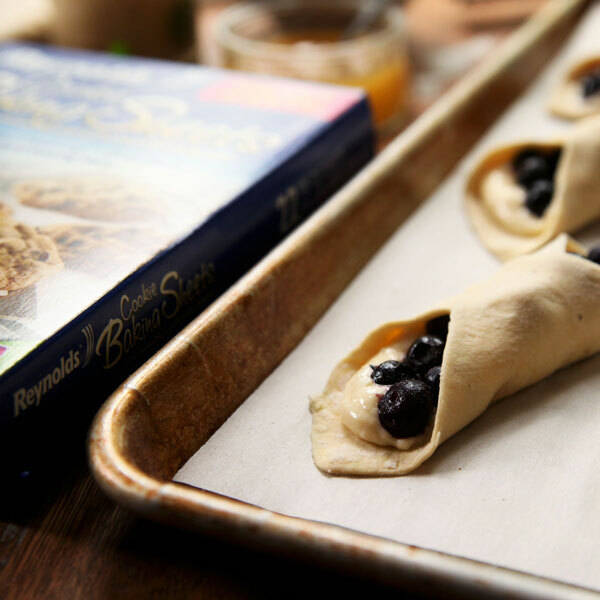 After each tart has a generous amount of creamy filling I add a small handful of blueberries before folding corners over each other and then baking. After the tarts come out of the oven, I like to dust each tart with confectioner’s sugar to add that special professional-looking touch people always appreciate. I like making them because people absolutely love them. Often times I get way too much credit baking treats that looks and tastes like I spent hours on. All the glory without the fuss – definitely my type of recipe. If you’ve never baked with puff pastry or you’re a pro using this magical dough, this recipe is impressive and you’ll appreciate the reward of your labor, even if you hardly labored at all. For this recipe I partnered with Reynolds for this sponsored post using their Reynolds Cookie Baking Sheets. When it comes to baking, parchment paper is a must. It will save you more headaches than you could ever imagine. Not to mention, parchment paper makes life so much easier from clean-up to having its non-stick paper release everything you have baked on it. I don’t recall the last time I baked without using parchment paper. In fact, I am very selective about the types of parchment paper I will use. This is what I’ve learned about what makes a great parchment paper. It must be thick and of high quality. Otherwise the paper could burn, curl up, or food items could stick to it. The quality of the non-stick attribute must be high enough where everything I bake on the sheet releases with ease and without hesitation. Reynolds nails all of this. When Reynolds sent me their pre-cut parchment paper sheets I didn’t have expectations about their performance. However, the first time I baked cookies on them I noticed right away the quality of the paper. It is weighted more than all other parchment papers. Not only this, having them already pre-cut saves me the hassle from having to cut parchment paper from a roll to the correct size. These 12 in. x 16 in. sheets fit a standard baking sheet perfectly instead of having to fiddle with it when lining rimmed baking sheets. The paper also lays flat and my tarts lift right off the sheet. If you are going to use parchment paper, I highly recommend Reynolds Cookie Baking Sheets parchment paper. You will not be disappointed. 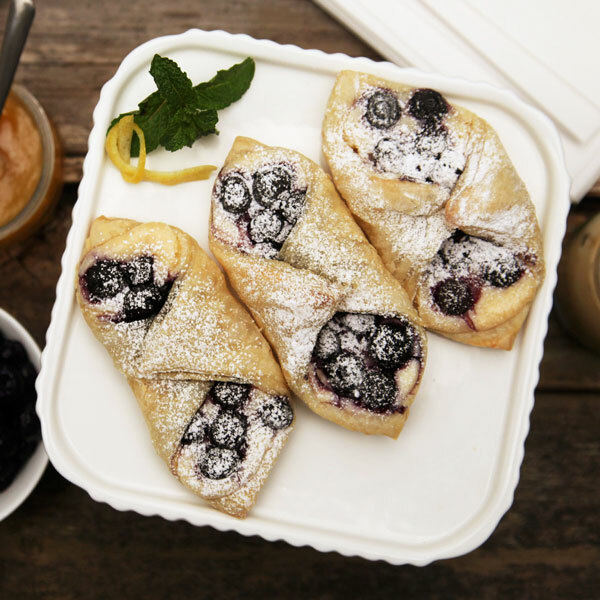 A delicious and simple fruit filled pastry with a lemon cream cheese filling. Thaw the puff pastry sheets according to the package directions. Using an electric hand or stand mixer, beat the cream cheese, condensed milk, and lemon curd until nice and creamy. 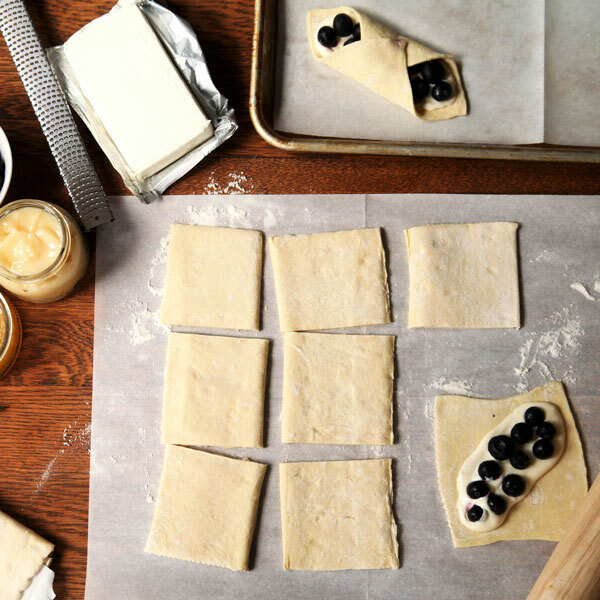 When the puff pastry is ready to be used, cut each sheet into 9 equal (3x3) pieces. Roll each piece out on a lightly floured surface until they are slightly larger. Spoon and spread a heaping tablespoon of filling in the center of each square going corner to corner. Lift the opposite corners over the center filling until they barely overlap. Dip a finger in water and apply it to corner overlapping the other to help it stick. 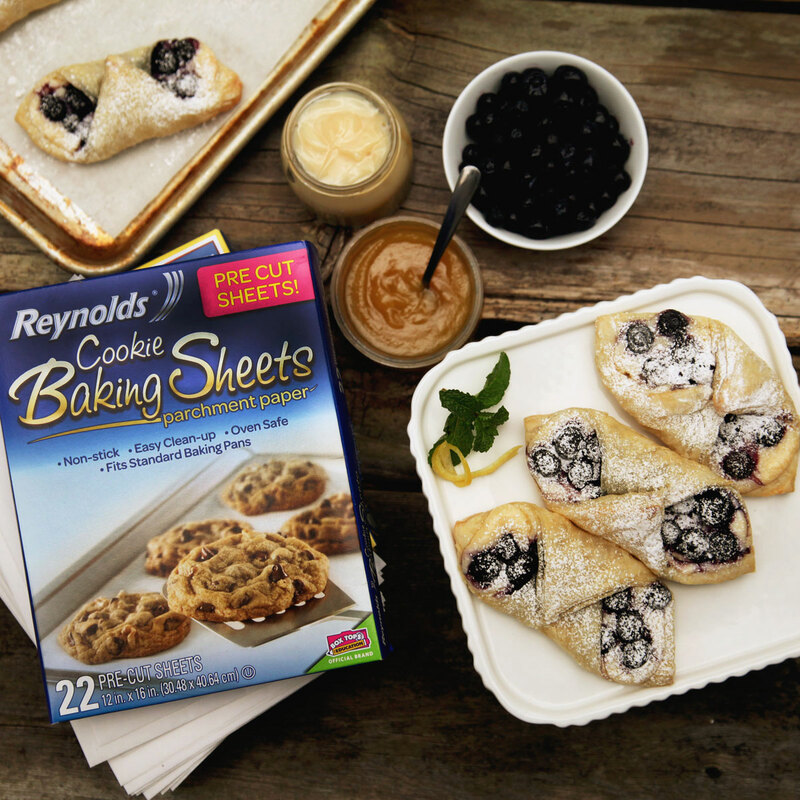 Place the tarts on a Reynolds Cookie Baking Sheet parchment paper lined baking sheet. Bake for 18-20 minutes until the bottoms of golden brown and the outer crust is light but flaky. Optional: Dust each tart with confectioners’ sugar before serving. Trats are looking awesome with cheese,lemon and blueberry! Wow! Lovely and beautiful tarts. My kid love blueberries and big fan of tarts from his childhood time. He insists me to prepare it every week and I too love making it for him. Thanks for sharing this tart recipe. another great recipe, love these flavors and the puff pastry, plus cream cheese! thank you for this recipe! I just loved making these: they are wonderful! I have had a little trouble when I’ve worked with puff pasty before – not this time. I will make these again and again! I would name them mini lemon blueberry Danishes!